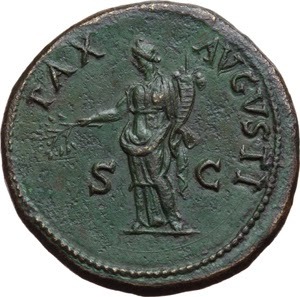 Titus Flavius Vespasianus was born north of Rome in Reate in 9 AD into a family of equestrian rank. His father, Flavius Sabinus was a tax collector. Both Vespasian and his brother rose to the office of senator. His military career gained him much recognition. He earned the insignia of a Triumph for his work in the army of Claudius during the invasion of Britain. He held a consulship, two priesthoods and was proconsul of Africa. 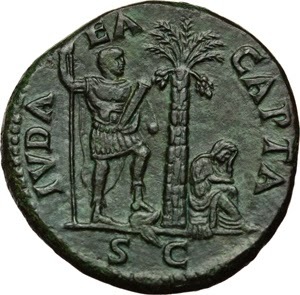 Under Nero, he was appointed governor of Judea. His task was to put down the First Jewish Revolt. In about one year, he had succeeded in suppressing unrest in the state, Jerusalem being the main exception. 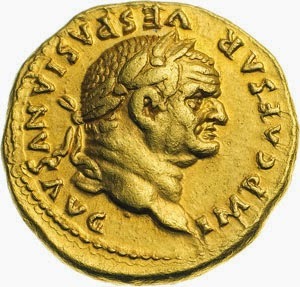 Upon the death of Nero, Vespasian gave his support to Galba in his quest to be emperor. With the murder of Galba, and the suicide of Otho, Vitellius and his supporters saw and opportunity to grasp for power. 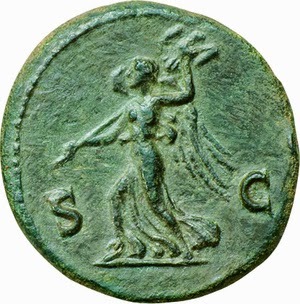 In July of 69 the legions of Egypt, Judea and Syria swore oaths of allegiance to Vespasian. 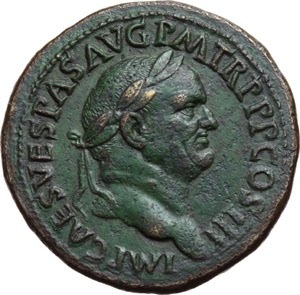 Vitellius had been named emperor, but was seen by Vespasian's supporters as a good target for a coup. By August, the Danubian legions were also firm backers of Vespasian. They were the first to reach Italy, and defeated the armies of Vitellius in the Second Battle of Bedriacum. One of Vespasian's commanders, Marcus Antonius Primus marched on Rome. 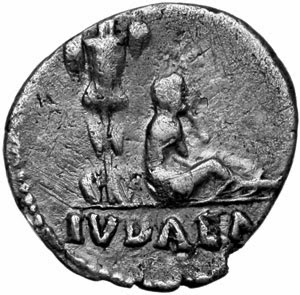 Primus' troops captured Vitellius and murdered him in the Forum. Vespasian was then quickly acclaimed emperor by the senate. The key theme of Vespasian's reign was one of peace through tactful management. He sent his son, Titus to subdue the revolt in Jerusalem. He also restructured his armies in a manner as to eliminate any powerful threats to his power. Legions were split up, regrouped and made smaller to eliminate any generals from being strong enough to pose a threat to the throne. He treated his soldiers firmly, but let them (and the senate) know that his power as emperor flowed from his military support. He also employed a management strategy that responded to the needs of the empire and its' provinces rather than just being responsive to just the needs of Rome and Italy. Two of the great public works projects that occurred during Vespasian's administration include the Temple of Peace and the Flavian Colosseum. Throughout his reign, Vespasian lived a vigorous life in good health. He died a natural death from a fever on 24 June 79 AD. He had gone to great lengths to establish a Flavian dynasty to succeed him upon his demise. His elder son, Titus became emperor at Vespasian's death, fulfilling his wish, despite stirrings in the senate by those who did not want dynastic rule.